MRIMed's Stainless Steel Non-Magnetic, Bariatric Stretcher boasts 600 pound weight capacity and 12" fold down side rails for easy accessibility and patient safety. Fowler back adjusts from 0 to 75 degrees with 13 positions to provide optimum patient comfort. A non-marring bumper protects all side of the stretcher. 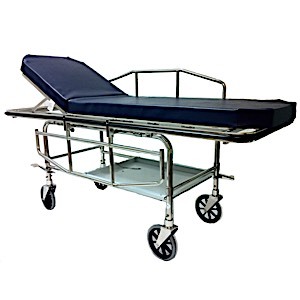 Versatile, durable stretchers have four locking casters, grounding chain, 3" pad and 77" x 31" storage tray. The stretcher surface is 73" long x 30" wide and 29.5" high. Comes with (2) Locking Casters, grounding chain. Optional IV Pole & O2 Holder also available. MR Conditional to 3 Tesla.